Friday May 7 was the thirteenth and final meeting of the Sustainability Book Club. I looked forward to that conclusion with mixed feelings. Since I had deferred my last year of part-time teaching until 2010-2011, it constituted my only regular contact with the University and a small remnant of the teaching obligations that had weighed heavily as complete retirement approached. I welcomed the relief and dreaded the loss. It was also an occasion to evaluate the project—through the judgments of participants who’d filled out a questionnaire circulated by the Center for Teaching and Learning which hosted and supported it, and through my own reflection. The gift of a collection of environmental writings signed by most of the seminar members a few months ago made me less anxious about their verdict than about my own. The drama of the moment lay in a choice I’d have to make about whether or not this outcome warranted the effort of trying to renew the program for next year. The last meeting’s moderator was Rob Rutherford, Professor of Animal Science, Director of the Sheep Unit, veteran Sustainability activist, voracious reader whom I liked to call our Good Shepherd. He’d selected a book called Resilience Thinking, as our text for the day. It introduced a concept new to me, which for some people was replacing the idea of Sustainability at the cutting edge of environmental discourse. It emphasized 1)observing processes from multiple scales to understand how very small and very large changes interacted and 2)studying universal cyclic stages of growth, solidification, decay and reconstitution. I’d found the book poorly organized–often redundant, yet in several places too dense in its use of models plotted with three dimensional calculus. However, its elaboration of the idea of tipping points–when systems lose the capacity to absorb disturbance and flip into conditions with new baselines of equilibrium–seemed applicable to the Deepwater Horizon Oil Spill two weeks old at the time, after which the return to the kind of stability implied by “sustainability” seems increasingly unlikely. Rob had suggested that instead of meeting in our regular location on the fifth floor of the library, we get together at Cheda Ranch, the home of the sheep unit, where he would show us around a landscape that embodied some of the resilience concepts and where he could serve us some of its highly sustainable fruits: fresh lamb, bred, raised and barbequed by his students. 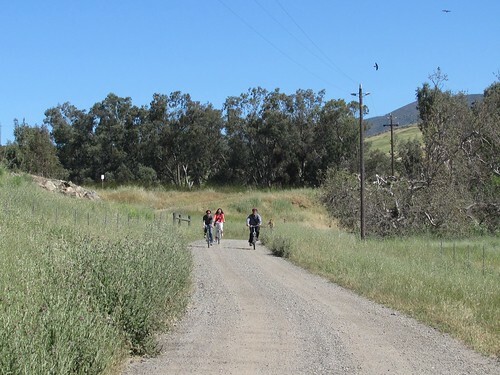 I biked out a little early on that glorious May morning, approaching the ranch through a gate across the road from the Poultry Unit, one of those notorious CAFO’s, which kept five hens in each two foot square cage, which I had visited with my Cal Poly Land students a few years ago. 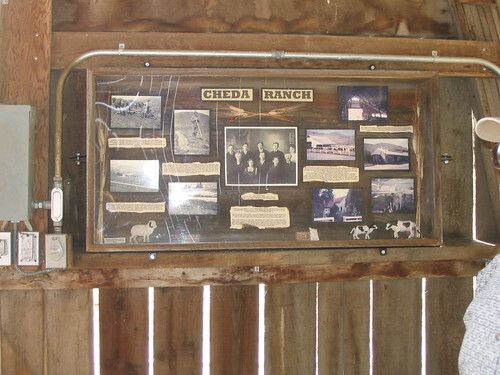 The sight of the old Cheda barn nestled in the vegetation around Stenner Creek and guarded over by the monolith of Bishop Peak, recalled the many times I had made the pilgrimage to this historic hardly known corner of the University’s large land holdings. and introduced them to the idea of holistic management. Not noticing me, Rob drove a little cart past the barn entrance loaded with folding chairs and tables and headed toward the sheep paddock where he’d arranged for us to meet. 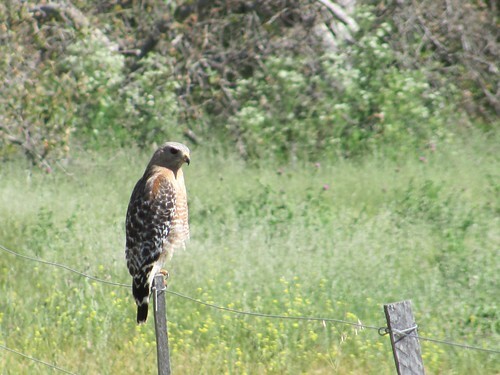 Down the road from the reservoir four members of the book club came racing on their bicycles and scaring off the hawk. Four more people moseyed over from the parking lot. Rob returned to lead us by foot across the creek and riparian corridor which had recently been returned to health as a result of proper sheep grazing management after decades of degradation caused by earlier overuse and later neglect. Last winter two good sized steelhead trout were observed there, illustrating the principle of resilience. At our meeting place upstream, Rob had placed paper bags full of raw wool (yessir, yessir) on chairs for each of us arranged to enjoy sunshine or shade. 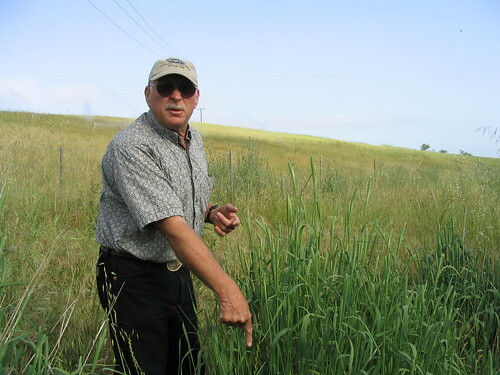 This was the perfect fibre, he noted, stronger than steel, durable, waterproof, and produced by animals transforming vegetation created from water, soil and sunshine with no other inputs. I said nothing about the classic account of the effect of sheep on landscape and rural economy found in Thomas More’s Utopia and cited at length by Vananda Shiva. We exchanged widely divergent impressions of Resilience Thinking, a couple of people planning to assign it in their classes, others having no use for it. The sheep flock came as close as the electric fence permitted, occasionally bleating their opinions. An hour later, three students arrived in the cart and set barbequed lamb, chopped heirloom tomatoes and other fixings for pita pockets on the white linen covered table. Even those of us who’d recently converted to vegetarianism couldn’t resist partaking of the marvelous offering grown in our own back yard. On the walk out to the paddock, Christine had handed me her tabulated results of the questionnaire. It’s taken me several weeks to consider them. As opposed to student evaluation forms, which I rarely found useful, there was no way to discount the opinions of faculty colleagues. Ten questionnaires were returned out of probably about twenty distributed by email. Twelve people were “presenters,” that is actually enrolled in the program, recipients of free books and a stipend and obligated to moderate one session. Seven respondents identified themselves as presenters and five identified themselves as “participants,” regular attendees who were not enrolled. The non-response rate suggests that the results were skewed positive. Eight respondents were ladder faculty, two were lecturers. Five respondents had been here five years or less and five ten years or more. I had two motivations to join the book club – I wanted the encouragement to read new books and I wanted the opportunity to meet and better know colleagues across the colleges who are interested in sustainability (broadly defined). I met both of those objectives. The opportunity to read about sustainability from a different perspective. It was also wonderful to learn that others in our community were interested in advancing their knowledge about sustainability. Finally, I really enjoyed the conversations. The presentation of books that I would not read outside this opportunity. The presentation by other participants and the opinions about issues raised in the books. The discussions by colleagues from different colleges, and the monthly schedule for reading one book by all. I am roundly enthusiastic about my experience in the SBC and might list any number of things here. In broad form, it was most illuminating to have a truly interdisciplinary conversation about a series of excellent, often challenging books and ideas. I learned as much from my colleagues as from the texts and am grateful for the various perspectives to which I was introduced. My whole notion of “sustainability”—what it is, who the stakeholders are, to whom it applies, etc.—has been significantly revised and expanded over the course of the last year and a half. This workshop has been extremely important to the development and reinforcement of my research and pedagogical interests and approaches. Discussion with colleagues from other disciplines that I didn’t previously know. Hearing other perspectives because of the interdisciplinary membership. Presenters did an excellent job. Each of these echoed my own positive responses. I was nervous before the meetings and excited by them from the first minute to the last. Having an extended voluntary conversation on a shared topic allowed me to appreciate the wit and wisdom of colleagues. Reading the books closely, whether or not I liked them, offered bracing mental exercise and brought me current on important topics. A high standard was maintained by each moderator’s prepared introduction of the book, which was preserved for useful reference on the wiki, along with detailed notes on the discussion, outlines of the books’ content and some written reflections by seminar members, including Alypios regular trenchant reviews. Quality of the books. The content was at times more rhetoric than useful, and the essence also got repetitive which became boring. More discussion/work on how to tie to curriculum. Would like to know if there was any consensus on the learning gained and how the learning is going to be actually utilized. What has the core decision making group achieved. They also confirmed my assessment. Spotty attendance was partly due to people being away at conferences and having conflicts with teaching schedules and partly to voting negatively with their feet. However, only one session, last May’s, drew fewer than ten and most drew fourteen or more. Another concern for me was a sense that a number of attendees hadn’t done much of the homework. This was partly due to the uneven quality of the readings, some of which were poorly edited, overburdened with rhetoric, and overlapping in content. Even two classic Sustainability books that felt like world-changing prophecy when they first came out, Biomimicry and Cradle to Cradle, seemed overly optimistic or questionably argued when reread in the cold light of recent history. But these aspirations never materialized, a significant factor being my own flagging commitment to them. And what accounts for that? In the big world, the new Congress and Administration’s being swamped with economic catastrophe and stymied by Republican obstructionism, the failures of Copenhagen, the slowing of progress toward a sane energy policy, the expansion of our wars in Asia, and the general continuation of business as usual in the face of growing crises. 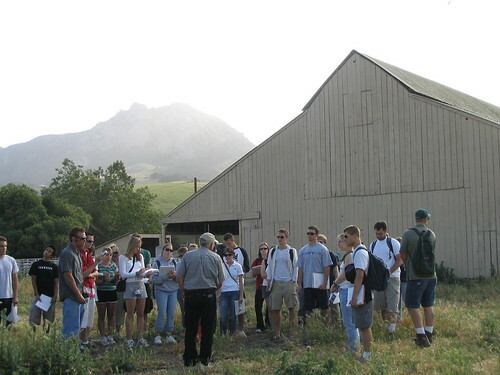 Cal Poly history took a parallel course: budget cuts, threats, and furloughs undermined hopes for experiment and reform, the sudden disappearance of the UNIV program eliminated any institutional framework for mounting interdisciplinary courses, and the Academic Senate Sustainability Committee itself was threatened with dissolution. Over time, the Book Club itself settled into a comfortable groove. Presenters gave polished introductions, discussion was fluent, strangers became familiar, and the activity seemed sufficiently satisfying without moving toward goals. The Necessary Revolution was put on hold. With one exception. The most prominent theme running through all the books that we read related to food. Whether in McKibbens call for localism in agricultural production and distribution, Pearce’s account of the water lost and polluted by industrial agriculture around the world, Foer’s expose of CAFO’s and story of his conversion to vegetarianism, Louv’s report on the value of school vegetable gardens, Shiva’s call for resistance to global chemical-food monopolies and rescue of small farmers, all seemed to reinforce the vision of sustainable agriculture and sensible eating habits presented in Michael Pollan’s In Defense of Food. 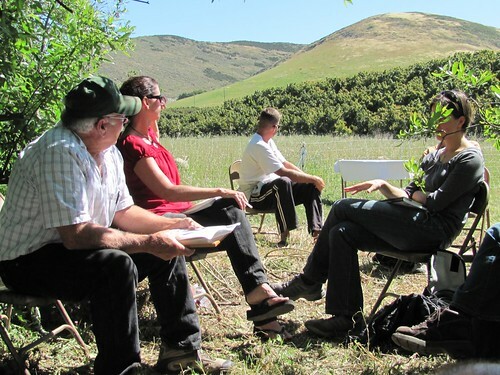 This was amplified in the talks Pollan gave at Cal Poly last October, hosted by our Book Club member, Hunter Francis, and the Sustainable Ag Resource Consortium, recently reinvented as the CAFÉ Center for Sustainability. 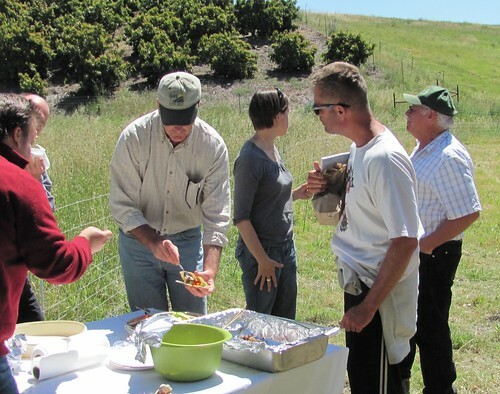 Cal Poly’s role in the food system controversy put him and fellow member Rob Rutherford in worldwide headlines for a couple of weeks, highlighted the contrast between sustainability and its opponents, and appears now to be in a state of real transformation. Our readings on food changed at least two of our members’ behavior in significant ways, turning us from omnivores into qualified vegetarians (fresh lamb raised by friends being an exception, as noted above). In addition they contributed to my tripling the size of my vegetable garden and focusing my own activist energy into developing a working farm, processing facility and distribution system to school lunch and food bank programs on city-owned land. Food seems an arena where on a personal level it’s possible to make strong changes toward sustainability without the major sacrifice of giving up one’s car or one’s travel plans, and where on a political level, promoting localism can have some appreciable consequence. The questions on the survey I had most difficulty answering dealt with the future of this project. Seven out of ten respondents said they would continue in it if offered next year and ten out of ten said they would recommend it to faculty colleagues. The Center for Teaching and Learning has offered continuing financial and logistic support. But given my misgivings, do I want to stay involved? After weeks of vacillating now I can say yes. Yesterday I started hunting for possible titles and came up with nine books published in the last two years that sound intriguing. I’d like to try alternate formats for some meetings, such as reading and commenting on blogs like Andrew Revkin’s dot.earth or Real Climate.com, or picking a theme like oil addiction instead of a book to discuss. So whether or not the Club will meet again next year will now, as they say, depend upon enrollment.